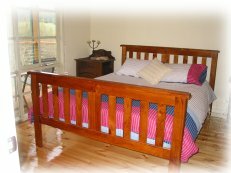 Wattletree Cottage contains 5 fully featured bedrooms. Each bedroom is also equipped with Nobo Panel Heaters. For further information on this see the Bedroom Heaters Page. There is also pull out comfortable double bed is also available. This is found near sitting area, near front bathroom. All doonas, blankets and pillows are provided. You need to bring your own sheets (top and bottom), pillow case and towels.